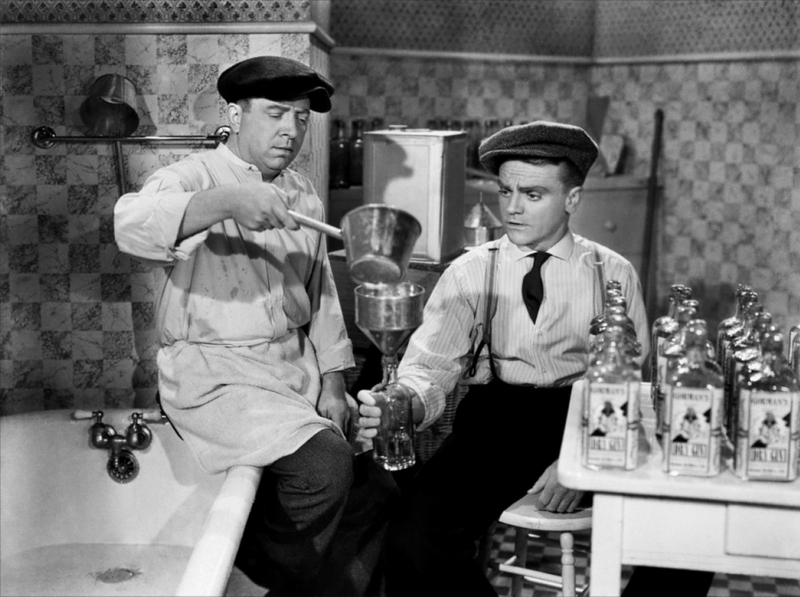 Eddie Bartlett (James Cagney) and George Hally (Humphrey Bogart) are buddies in combat in France during world War I. They meet and befriend Lloyd Hart (Jeffrey Lynn), a law school student, at the tail end of the war. While George’s post-war plans may not exactly be on the right side of the law, Eddie is an upstanding citizen who wants to work hard at the garage where he worked before the war, saving up enough money to open up his own place some day. Back in the US, things don’t quite go as planned. Eddie isn’t able to get his old job back. The girl he’d been corresponding with during the war, Jean Sherman (Priscilla Lane), turns out to be a mere teenager. And soon, the Volstead Act passes, beginning the long and difficult era of prohibition. With prohibition in place, Eddie is working as a cab driver. After being asked by a passenger to deliver something to Panama Smith (who happens to be the owner of a speakeasy, and is portrayed by Gladys George), Eddie is arrested, and so begins his journey into the world of bootlegging. As the 1920s progress, Eddie gets further absorbed into the criminal world, finding both great riches and a whole lot of trouble. Raoul Walsh (1941’s High Sierra, 1949’s White Heat) directs 1939’s The Roaring Twenties, a film that covers a pretty large time span from the end of World War I all the way to the Christmas season of 1929. The film is based on an original story by Mark Hellinger (1946’s The Killers) and was adapted for the screen by Jerry Wald (They Drive By Night), Richard Macaulay (Born to Kill) and Robert Rossen (The Strange Love of Martha Ivers). I’d be lying if I said The Roaring Twenties didn’t draw me in with its pretty, sparkly opening titles. Top that off with a bit of text about how the characters are based on the writer’s cronies and how these true events should be remembered, and you’ve won me over less than five minutes into the thing. Top it off again with the incorporation of newsreel-style narration/footage throughout the entire film (which is not only a great technique on its own, but also gives relevant background information as to what’s going on in the world that these characters live in) and I might start crying a little bit out of joy. Plot and performances aside, The Roaring Twenties delivers in so many ways that I was doomed to love it from the start. Of course, that’s not to say that the plot and performances are disappointing. In fact, I was highly impressed with those elements as well. This film has it all: great performances, interesting characters and an engaging story. There’s a mix of crime and love quadrangle (Eddie loves Jean, but Jean loves Lloyd! And Lloyd loves Jean too, while Panama pines for Eddie! How will they ever get that one worked out?) working together to keep the viewer’s mind occupied at all times. All of these things work together to make the film entirely gripping. It’s one of those films that just “clicks.” There are no slow or boring moments to speak of, and though the film isn’t quite as high on suspense as some crime dramas, it hooks the viewer and includes a number of high-tension moments to bolster anxiety in the audience. Even the ending is fantastic. It appears that it will be predictable, but ends up throwing one final unexpected moment at the viewer and is surprisingly very emotional, leaving a big impression on the audience. 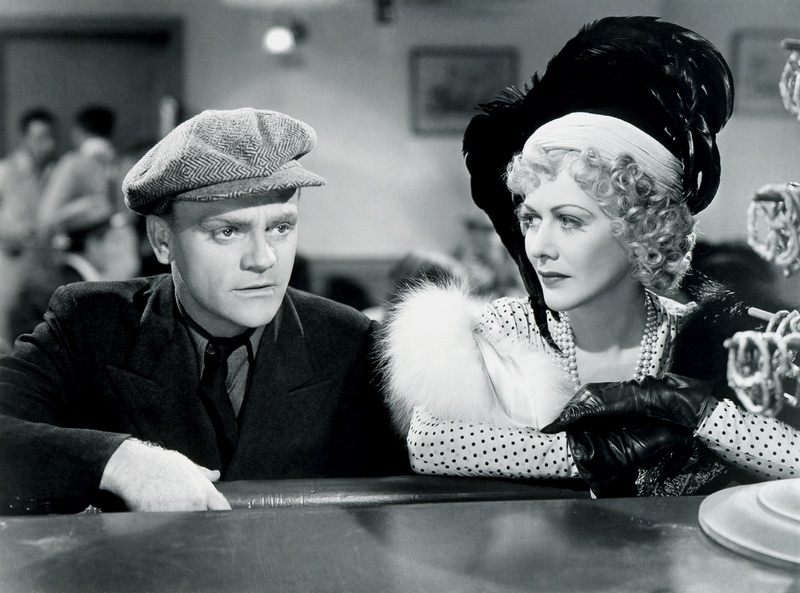 Sympathy is built for Cagney’s character early on. He’s an honest man who just wants to work hard and making a living for himself through his determination. But when he can’t find regular employment aside from a not-so-great cab driving gig, he turns to crime in order to make a living. This character is a reverse of those that Cagney played in films like Picture Snatcher, where he portrayed a “bad” man attempting to go “good” and get an honest gig. I’m about as law-abiding as they come, but even I could easily sympathize with Eddie’s predicament when he couldn’t reach his goal of owning a garage and got caught up in a life of crime instead. The Roaring Twenties is a fantastic, entirely gripping film that boasts spot-on performances and a perfectly bleak story. It gives the viewer an exciting peek into the bootlegging industry that ran so rampant during the prohibition era. The score: 5/5! 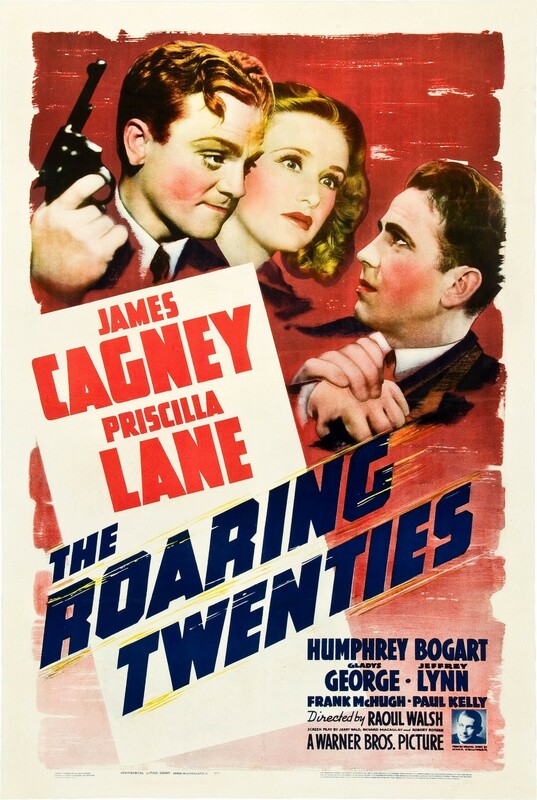 In addition to the Warner Night at the Movies, commentary for the film is provided by historian Dr. Lincoln Hurst, and there is a featurette titled The Roaring ’20s: The World Moves On, which can be found in the special features menu. And on top of that (As though it could get any better!) the picture and sound quality of the film and all of the additional features is absolutely top-notch. DVD score: 5/5! I think you should consider a career as an classic movie salesperson. If such a career exists, that is. Next Next post: Off Topic Thursday: Book buys and library picks!